…and now is your chance to take advantage of this rare opportunity which is so close to the City. A bare block of 6.0900 Hectares enticed our owners to return to the country life and what they have created here is to be commended. 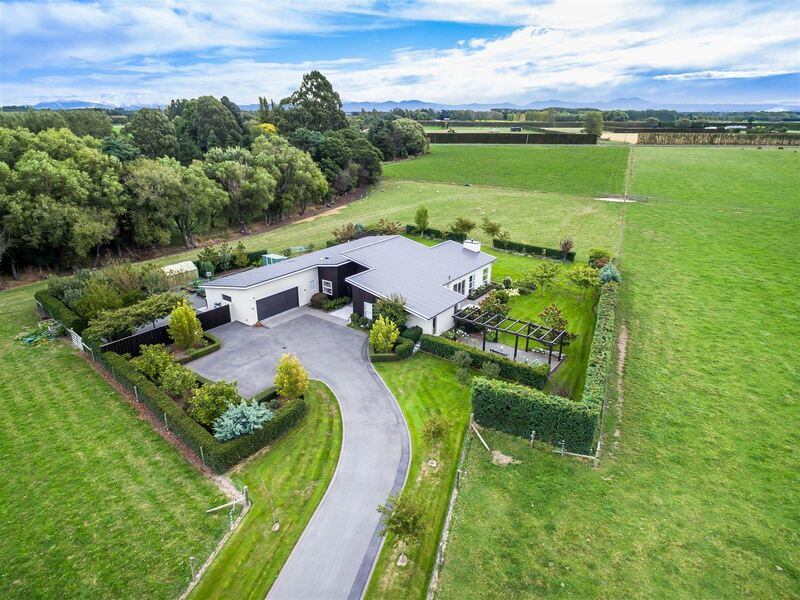 The sweeping panel and post, planted driveway welcomes you to the home while a separate street entrance way services the 4 bay barn (16m x 6m) and stock yards. Thoughtfully divided into 4 paddocks with dual access available off Ellesmere Road. Very fertile soils capable of a multitude of uses. Established shelter belts also provide privacy for the home. The single level home of 311m2 (approximately) offers versatile family and formal living areas which flow to the north facing deck and garden and enjoys a picture book vista and captures all day sun. Those who enjoy cooking and entertaining will not be disappointed in the well-appointed kitchen which is complemented by a spacious butlers pantry along with a list of quality inclusions. The practical layout has the main bedroom separate from the remaining 3 double bedrooms along with a generous home office which could be utilised as another bedroom. Great garaging with storage and boot room plus off street parking for guests or additional vehicles. Just a short walk to the popular Ladbrook School and zoned for Lincoln High School. Our owners are now resolute on moving back to town so don’t hesitate in contacting us for more information or to register your interest now. Price will be Plus GST (if any). Auction Wednesday 1st May, 10:00am at Holmwood Auction Rooms, Ground Floor, 397 -399 Ilam Road, Ilam (unless sold prior).